Chrome: If you've been using Twitter for years and follow a lot of people, you can eventually lose track of who everyone is and why you followed them in the first place. 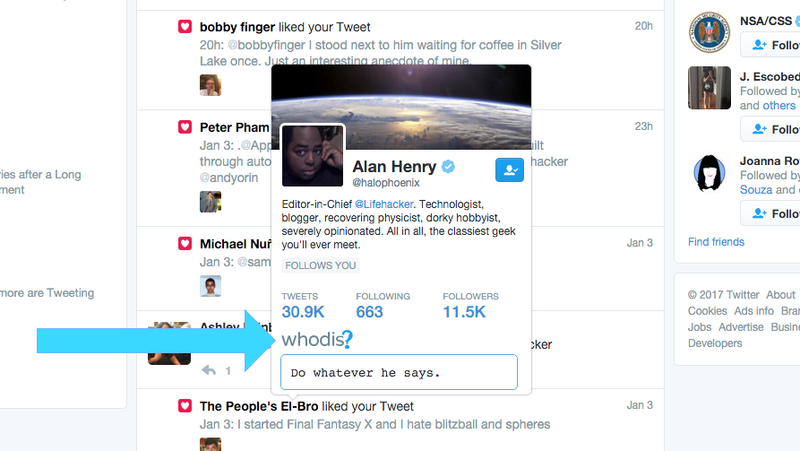 Whodis for Chrome adds the ability to add a note to anyone's profile. This is more useful if you're the sort of Twitter-obsessed person that follows thousands of people (as I am). Sometimes that means I follow an important but obscure person — say a CEO of company — who doesn't necessarily mark their profile as such, and when they pop up with something interesting to say, I might have already forgotten their context. Whodis simply lets you add a small private note to a person's profile. It could be their contact info, why you followed them, whatever — and it's only visible to you. It's a power-user problem, surely, but it's a small, useful tool to help wrangle an otherwise noisy website. Whodis is still in alpha so its fairly early in its development and it's free.